Free sat-nav on your phone | What Car? 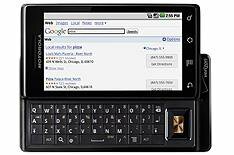 Motorola's Droid phone will go on sale in the US next month and will be the first phone to have Google Maps Navigation. The free application from Google is a turn-by-turn voice navigation service that, in effect, turns your phone into a sat-nav device. It also has voice recognition, live traffic updates and Google Street View to get you where you need to go. The phone goes on sale in the US on November 6, but there's no word yet on when UK buyers will get it. While this may seem like good news for buyers, the Google app is not so good for traditional sat-nav companies. Shares in Garmin and TomTom have fallen since Google announced the app's free inclusion.